Rob Cesternino and Akiva Wienerkur are never mistaken for their wives with their rich, radio voices, which they used to bring you the latest Seinfeld episode recap. 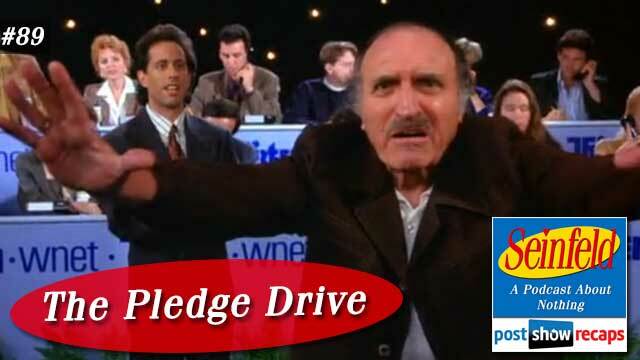 This week, they talked about “The Pledge Drive”, which first aired October 6, 1994 as part of season six. The episode was written by Tom Gammill and Max Pross. There was only a bit of Seinfeld news this week. Akiva researched any connection to Seinfeld with the recent celebrities that have passed. He learned that David Bowie was the musical guest in 1999 when Jerry hosted Saturday Night Live. Jerry has been asked to host a charity drive for PBS. He receives a thank you card from the woman Kristin who is running it, but throws it away after reading it. When Kristin sees the card in the trash, Jerry tries to prove he’s sentimental by showing her all his cards from his nana. When Kramer notices checks in all the cards from Jerry’s Nana, he convinces Jerry to cash them. Nana gets a call from her bank since the cashed checks overdrew her account. Nana tries to go down to the bank after not leaving the house alone for 25 years, but the bank wasn’t at the same location as the last time she was there. Uncle Leo calls Jerry to tell him Nana was missing. Nana, who found the new location of the bank, calls Jerry from there, but Elaine answers and thinks it’s Dan, so she yells then hangs up. George is tasked with finding a Yankee to appear on the pledge drive, trying to appeal to the Yankee brass by pushing the network’s high culture. He wins over his boss Morgan on the idea when Morgan sees him eloquently eating his candy bar with a knife and fork, after being impressed when hearing Elaine talk about Mr. Pitt doing the same thing. George’s second plot line has him reeling from the waitress at Monk’s secretly giving him the middle finger at every opportunity. This comes to a head when George is driving Danny Tartabull to the pledge drive and sees another driver flip him off. He chases the driver for an hour only to learn the man had his hand in a cast projecting his middle finger up, leading to Danny Tartabull missing the pledge drive appearance. Elaine’s story starts with her hearing from Jerry that her friend Noreen hit on him. When she calls to confront Noreen, she mistakes her boyfriend Dan for Noreen, since his voice sounds exactly like hers. She mentions how Jerry thought Noreen was hitting on him, causing Dan to get upset. She would later hear Jerry’s reason why he thought she was flirting, and her and George disproved it. When Noreen learns this and asks Elaine about it, Elaine inadvertently turns Noreen off from Dan, pointing out his high talking, leading to her actually being attracted to Jerry now. Dan shows up at PBS to confront Jerry, but Jerry thinks it’s Noreen’s voice, so when he sends Kramer out to handle it, Kramer confuses Dan by assuming it’s him who’s attracted to Jerry. Kramer had small parts that wove through Jerry’s storyline. First, he decides to work the phones at the pledge drive Jerry is hosting, though he wants a cut of the proceeds. He also notices Jerry’s cards from his nana’s and convinces him to cash them. All the stories piece together in the ending segment. Uncle Leo comes by the pledge drive to assure Jerry that Nana’s okay, and tries to give him money. Nana calls in to the pledge drive, but Kramer answers and thinks it Dan at first, reassuring him that Jerry is not interested. Nana tells him she is Jerry’s grandmother, and she wants to give her money to Jerry, not PBS. The scene cuts to Monk’s, where Jerry shows a card from Kristin that has Bugs Bunny giving him the middle finger on it. Lastly, Jerry sees everyone in the surrounding tables at the diner eating candy bars and deserts with a knife and fork. There were a few great tangents by Akiva and Rob this week. The guys discussed whether rich people worry about what is for dinner. Akiva tried to argue that him eating non chocolate candy is an extra bonus to avoid getting his hands dirty, though Rob took great exception, arguing that it’s fine if you just freeze the chocolate. They also discussed how hard it must be for athletes to deal with thousands of pleas to do charity events. Next, they talked about a plan to get the modern day Danny Tartabull out of child support trouble by pooling all his money toward Powerball tickets. Rob told a story about how his son opened up a the wrapper of a candy bar at the check out counter when he took his eye off him, forcing him to have to buy it. Later on, Nicole was disappointed because the 100 grand bar wasn’t one she liked. 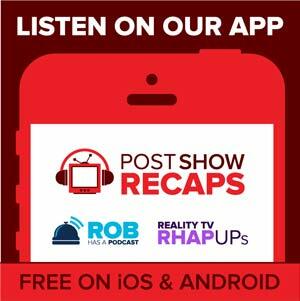 Rob and Akiva agreed that this episode doesn’t have anything that wouldn’t work in 2016. Akiva really enjoyed the episode, finding himself laughing out loud at several points, so he ranked the episode at 53, to which Rob thought it was a little low. They led off grading the core four with George, both agreeing that he deserved an A. They thought Jerry deserved an A, Kramer deserved an A-, and Elaine deserved an A-. For emails this week, they led off with Colin, the delivery guy expert, who mentioned how common it is for those in customer service to use derision. He also wondered if either of them have sought revenge on customers in their time in customer service. Rob had an annoying customer or two during his time as a waiter, but Akiva had never worked in the field. Johnny De Silveira wondered where Danny Tartabull got a knife and fork in George’s car. Craig wondered why eating a candy bar with utensils hadn’t taken off like many things from Seinfeld. Amir thought it was a great episode, noting he loved how Kramer subscribes to Fortune Magazine. He also asked how they would rank the high talker, the low talker and the close talker. Akiva ranked the high talker the most annoying, while Rob thought the close talker would be the worst. Lastly, Chester wondered why we haven’t heard of Jerry’s Nana before this. He also wondered why so many people would be eating candy bars at the diner. Akiva thought people just brought them in and did it to make a statement. Tune in next week as the guys will recap “The Chinese Woman”. Send in your questions by emailing [email protected] ps.com. Don’t forget to subscribe to the podcast by going to postshowrecaps.com/ seinfeldITunes where you can rate and review the podcast. You can get a discussion going about the podcast by leaving a comment on the show page, and as always, you can follow them on Twitter @robcesternino and @keev26.